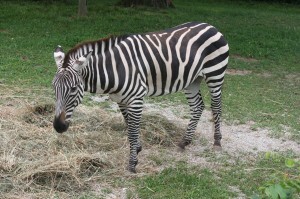 Zebras inhabit grassy regions in the tropical and temperate zones of Africa. You can tell the mood of our zebra by watching its ears; erect ears indicate calm, ears straining forward denote fear, and ears flattened back indicate anger. The upper and lower incisors are chisel-shaped and are used to cut vegetables. The cheek teeth are large and have a complex structure. Zebras live in large herds and are usually led by an old stallion. This makes them more effective at detecting predators. They generally outrun their enemies. If they can’t outrun an enemy, they will kick and bite. Our male zebra, Chad, was born November 26, 1993. Zoe was born in 2007 in New Mexico. She moved to the Tulsa Zoo and then came to Scovill Zoo in April 2013. Chad & Zoe are Grant’s zebra.